Revolutionising larger airconditioning installations in South Africa, Samsung's Digital Variable Multisystem ensures highly-efficient and environmentally-friendly airconditioning for commercial use as well as upmarket luxury homes. A single variable-capacity exterior compressor linked to multiple indoor units can be positioned up to 170 metres away for easy concealment. Up to 50 metres allowable height difference between indoor and outdoor units allows for airconditioning of multiple storeys. Each room or office has individual temperature control. Samsung's DVM compressor has a variable capacity from 10% to 100%. Thus if only one or two indoor units are in operation, the compressor operates at a fraction of its capacity, effecting major electricity savings. Capacities from 60 000 BTU/hr up to 520 000 BTU/hr allow for the airconditioning of a variable number of different rooms from one exterior unit. Samsung's DVM unit can be linked to a variety of indoor units: midwall splits, ceiling cassette units, ducted units or underceilings. 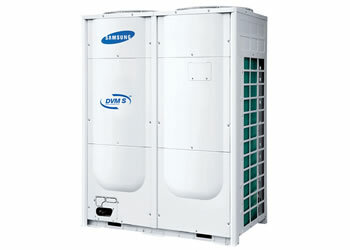 Ultra-modern energy-efficient airconditioning, backed by the nationwide support of Samsung Air!